The good people at our Petaluma Visitor Center facilitate monthly city-wide marketing meetings in different locations around town. 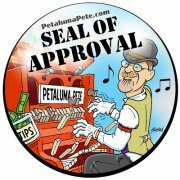 So far, two of my favorites were held inside Mrs. Grossman’s Sticker Factory and the other inside the Seed Bank at the cornet of Washington and Petaluma Blvd. Last week, the meeting took on historical proportions on many fronts, including a speaker lineup (or should I say “shoot-out” at the OK corral) the likes of which I have never seen before. Plus, the gang gathered in what could possibly be the most beautiful, inspiring, sun-filled event and banquet room in the entire city… right up there with the Masonic Lodge building and Historical Library Museum. Also, did you see this great article from Katie? Did you know Petaluma’s feed mill is the tallest building in Sonoma County? Did you know it towers above all those businesses north of Petaluma Blvd like a big, majestic elephant in the room? Did you know this structure is so big you can see it from the 101 freeway? Doesn’t it make sense to call the shopping area north of Washington St. the Feed Mill District? Here is a rough draft of a logo I threw together to give you an idea of the direction in my head.